Since the American Association of Geographers (AAG) and Esri began conducting outreach in April 2015 to encourage people to become GeoMentors, the program has attracted more than 1,000 participants. A biologist with the National Park Service who uses ArcGIS regularly. An Advanced Placement Human Geography teacher who is integrating ArcGIS Online into lessons. A GIS software architect and developer for a major corporation. A graduate student in an applied geography and geospatial program. An urban planner employed by the real estate department of a local government. A certified health educator who has a certificate in GIS. This range of expertise reflects the interdisciplinary nature of GIS. And having GeoMentors from such distinct backgrounds reflects just how widely geospatial technology can be applied to different classroom subjects and used by students with varying skill levels. In concert with the GeoMentor program, which is part of Esri's commitment to the Obama administration's ConnectED initiative, Esri has also spurred the development of materials for K–12 curriculum that facilitate using GIS in classrooms. These GeoInquiries (available at edcommunity.esri.com) are short activities for teaching map-based concepts, and there are now three sets of them. Tied directly to lessons that appear in commonly used textbooks, these 15-minute online GIS exercises serve as a great way to introduce geospatial technology to the classroom. Currently, there are GeoInquiries available for middle school earth science and high school US history and human geography courses. GeoMentors use these resources, among others, as a starting point to illustrate the possibilities for using GIS with different subjects in the classroom. 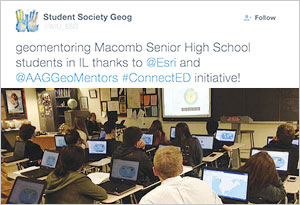 GeoMentors assist K–12 schools across the United States with incorporating GIS into their classroom curriculum. "They are great and [were] helpful when I told them I needed help using ArcGIS in my AP [Human Geography] and AP World History classes," Siler expressed in a testimonial. "Thank you so much for providing this service for educators like me who want to use ArcGIS more in [our] classes but aren't very familiar with how it works." The AAG constantly receives reports about GeoMentor-facilitated activities and collaborations throughout the country. These undertakings range in grade level and length of time and address various GIS skills and topics. GeoMentors engage in singular events, such as making a career presentation to a class; they also participate in ongoing partnerships like working with a teacher throughout the school year. One GeoMentor visited a middle school in Riverside, California, to demonstrate how 3D GIS and ArcGIS Online can be used to model earthquakes in an attempt to mitigate architectural damage. Another GeoMentor was asked to give a presentation on teaching with maps and GIS at the Kansas Association of Middle Level Education. And another GeoMentor reached out to her daughter's fourth-grade teacher and inadvertently provoked the educator to change her entire lesson plan so it incorporated GIS. The program also has a growing collection of GeoMentor case studies in which volunteers offer in-depth reports of their activities and experiences as GeoMentors. These case studies highlight how collaborations between GeoMentors and educators are rewarding experiences for everyone involved. Being a GeoMentor can remind you of why you got into this field in the first place and what you enjoy about geography and GIS. It's also validation of how much you know and what knowledge you have to offer to others. As Chuck Powell, a GeoMentor in Arizona, related, "Working as a GeoMentor has been an amazing experience. The kids just love using the technology and love solving problems. It's the same reason I love GIS." And Diana Babshoff, a GeoMentor in California, said her experience made her feel more encouraged in her day-to-day work. "It reminded me of how fun GIS can be and how it can be applied to almost everything you do daily," she said. Everyone with some GIS experience or knowledge has something to offer K–12 classrooms, so consider joining our community. For more information about the GeoMentor program, visit geomentors.net. To volunteer, sign up online. Additionally, follow @AAGGeoMentors on Twitter and check out the GeoMentor program on Facebook. The GeoMentor staff can also be reached at geomentors@aag.org. 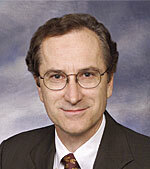 Doug Richardson and Candice Luebbering from the American Association of Geographers coauthored this column.